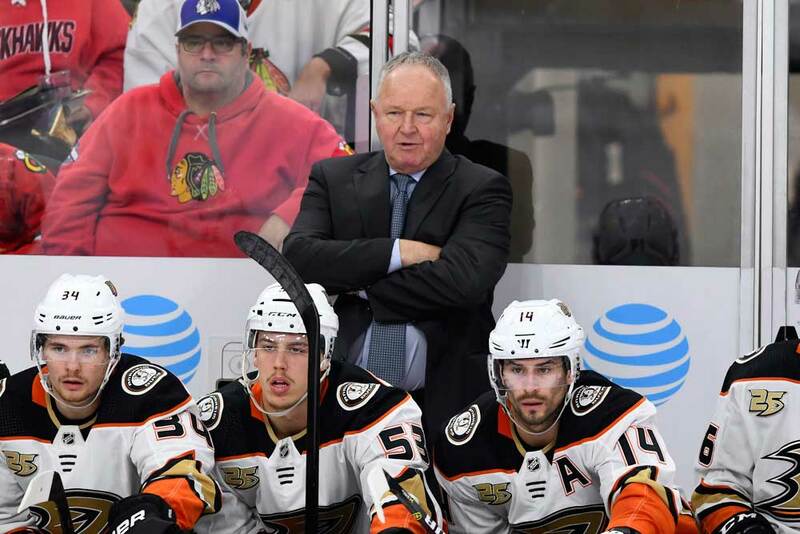 It wasn’t a matter of if, it was a matter of when the Anaheim Ducks would eventually realize they had to fire head coach Randy Carlyle. Well the axe finally fell on Feb. 10th after the Ducks were sunk for the seventh straight game and had managed a grand total of two wins in their past 21 contests. This was a move that arguably should have been made at least a month ago, but miraculously the Ducks are still just six points behind the last wild card playoff spot in the Western Conference. General manager Bob Murray did the firing and will be taking matters into his own hands by taking over behind the bench until the end of the season. The Ducks are 21-26-9 in 2018/19 and have been hit hard by injuries during the campaign. However, the team was spinning its wheels and something had to be done to get back on track. Murray has pulled off several minor trades recently, but the moves didn’t have the desired affect. Carlyle, who hails from Sudbury, Ontario, was in the midst of his second stint and 10th overall season as the club’s head coach. He guided the side to the playoffs the past two years and it was obvious he wasn’t going to make it three for three this spring. The 1980/81 Norris Trophy winner had better luck with the Ducks the first time around as he was hired in 2005/06 and won a Stanley Cup in Anaheim the very next season. He had worn out his welcome by 2010/11 though and was let go midway during the season when Bruce Boudreau was hired to take over. Between his two stints in Anaheim, Carlyle served as the Toronto Maple Leafs‘ head coach for almost four seasons to mixed reviews. He helped the Leafs reach the 2012/13 playoffs in the shortened 48-game season. But he watched firsthand as the team blew a 4-1 third-period lead against the Boston Bruins and to lose in overtime in game seven of their first-round series. Many fans blamed Carlyle for the collapse and he ended up back on the west coast after being fired in January of 2015 and Boudreau was let go at the end of 2015/16. Overall, the 62-year-old Carlyle’s record in Anaheim doesn’t read too badly as his team missed the playoffs just once in tenure there, not including this year. In addition, his record was 384-256-96 over that time and 111-74-35 since his return. He’s also the only man in history to play in at least 1,000 NHL games and coach in more than 900. His death sentence may have been unofficially signed back on Jan. 14th though when Murray publicly stated he wasn’t going to make a coaching change and gave Carlyle a vote of confidence. Since then the Ducks have lost eight of their 10 outings. This includes seven straight defeats with the team being outscored 80-32 in the last 21 games and being shut out four times. It’s unclear how the team will respond to Carlyle’s firing, but there’s nowhere to go but up really as the Ducks were nesting in the cellar of the Western Conference along with the Los Angeles Kings with their 51 points. Murray will take his place behind the bench on Feb. 13th when the Ducks host the Vancouver Canucks. The problem is, Murray doesn’t have any coaching experience. He’s held several jobs since retiring as a player in 1991, such as scout and GM, but head coach isn’t one of them. He’s been successful in Anaheim since taking over as the GM from Brian Burke in 2008/09 and has missed the playoffs just three times since. He’s been a finalist for the NHL’s GM of the year award three times and won it in 2014. Murray’s going to have to work some kind of magic to stop that number from reaching four however. The 64-year-old executive vice-president/head coach/GM from Kingston, Ontario is going to have a full plate since the trade deadline will soon arrive on Feb. 25Th . Murray’s going to be extremely busy as he figures out if any more player moves are warranted and he might have been better off naming an interim coach to help share the load. One name that has been mentioned to take over from Carlyle is Dallas Eakins, who’s currently behind the bench with the San Diego Gulls of the American Hockey League. The Anaheim farm team was an impressive 25-15-5 after 45 games so far under Eakins this season. Eakins has had enjoyed quite a bit of success at the AHL level with the Toronto Marlies and San Diego, but he went 36-63-14 in 113 games with the NHL’s Edmonton Oilers from 2013 to 2015 before being fired. Carlyle started his NHL coaching career as an assistant with the Winnipeg Jets then the Washington Capitals and had head coaching experience in the IHL and AHL with the Manitoba Moose. His all-time NHL coaching record stands at 475-334-115 and he’s gone 49-41 in the playoffs. Murray had no choice really but to let him go, but waiting this long to cut the ties may ultimately cost the Ducks a playoff spot.